As part of Clark University’s curriculum, they offer the LEEP program, or Liberal Education and Effective Practice. This program blends Clark’s rigorous liberal arts education with practical application, empowering students to take their life in the direction they choose. 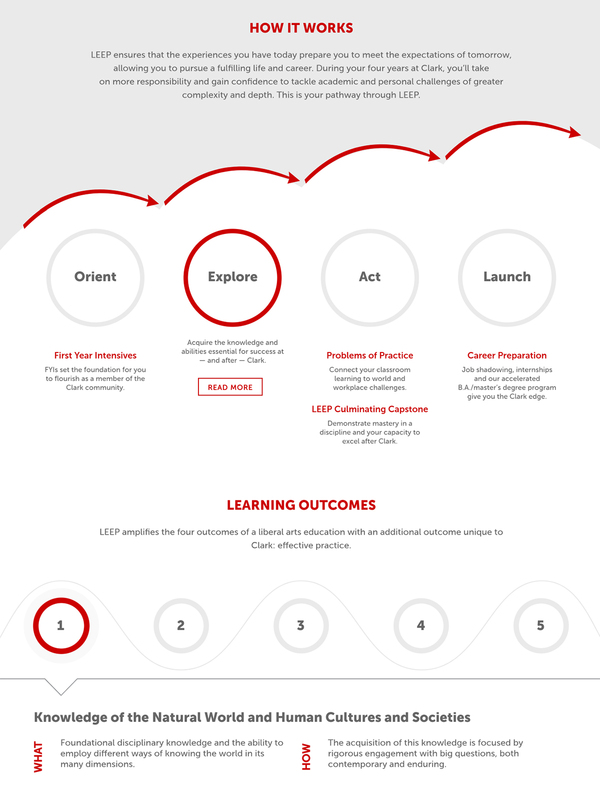 The Clark LEEP Program needed a visual revamp to depict how it works and the learning outcomes the program achieves. 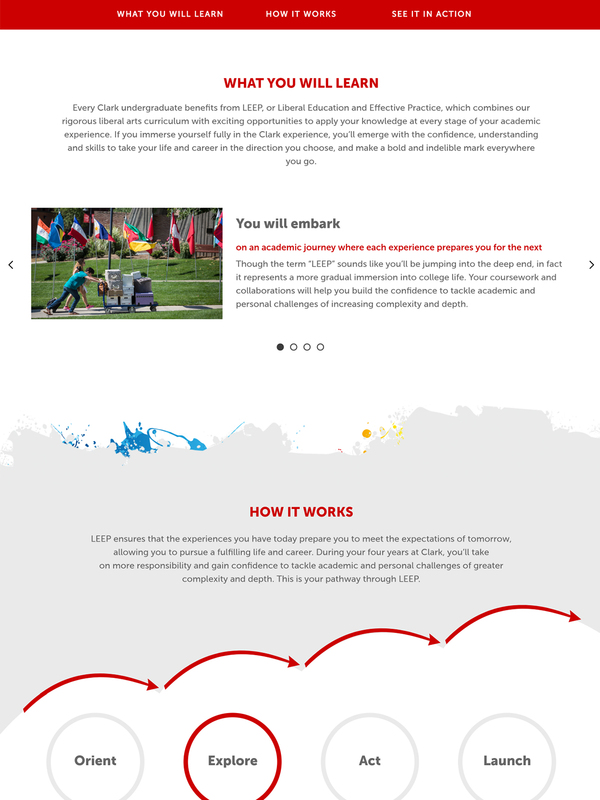 We partnered with them to redesign the LEEP landing page, as well as the inner pages that bring each student’s journey to life. 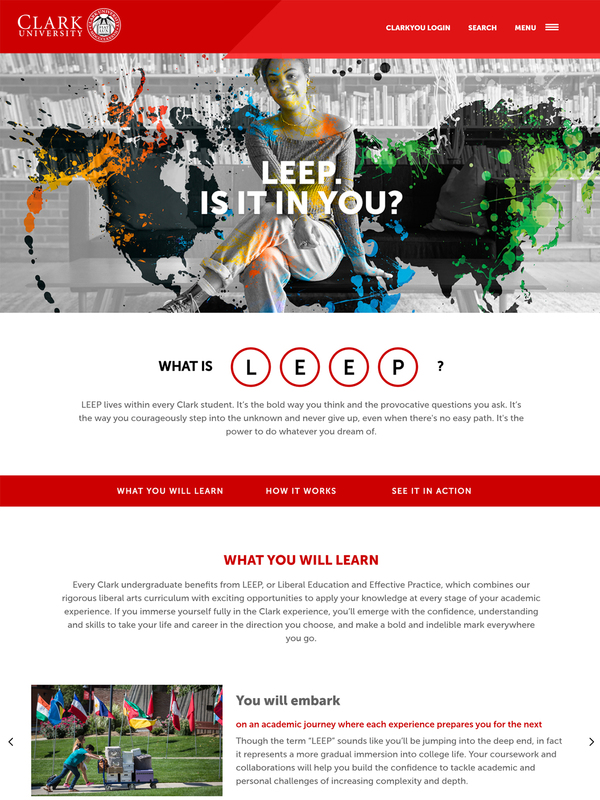 The “What is LEEP” page is aimed at capturing potential students and showcasing the process and benefits of the LEEP program. The “How it Works” section features the 4 steps, with animations and tiered arrows to reflect personal growth. Student transformation stands at the foundation of the LEEP program, so we made sure that message was illustrated in the design. This holds true in the pages of each individual student as well, emphasizing their journey. Worcester native Mohamed Elmaola exemplified the LEEP purpose with his dedication to youth and inspiring others. With the help of a friend, Mohamed founded Worcester Soccer House, which provides free soccer instruction to children who otherwise have could not afford to play. After connecting with local youth, he found success as a motivational speaker, empowering both elementary school students and the Clark community, to whom he presented a TEDxTalk. Now, Mohamed is enrolled in the National Army Guard, pushing himself to be better. Theatre Arts and Comparative Literature major Raechel Segal found her way through her First-Year Intensive, Queer Horror. In that class and other core courses, she connected with faculty members and developed her passion for playwriting, acting, and producing. As such, she has written and staged two plays, one of them being a LEEP project that focuses on disability and accessibility. She embraces eclectic roles and expanding her palette, which she says makes her more desirable to professional theatre companies. Currently, she’s revising her LEEP project play which she hopes to one day produce at Clark. 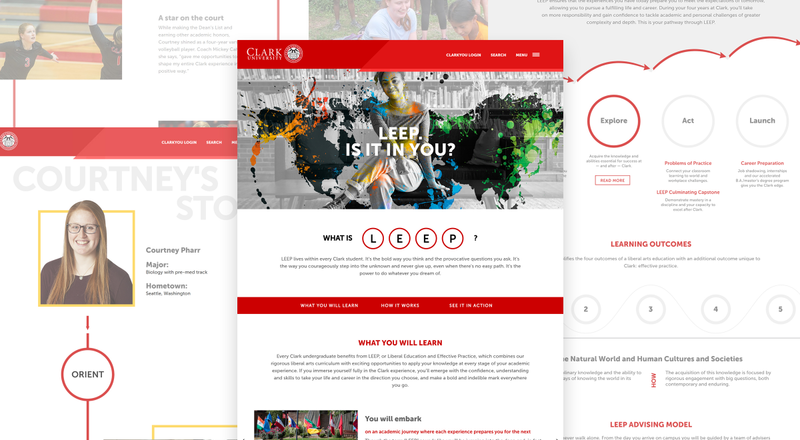 The best way to experience the Clark LEEP Journeys is to see it in action by going to the microsite and following the interactive red line. Click the “Visit Site” button below to explore each journey! 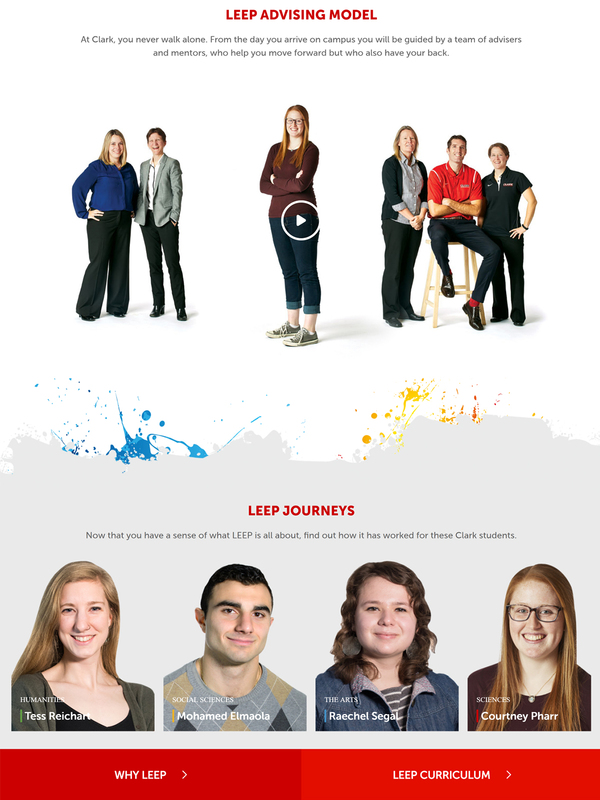 Looking to create a personal experience like the Clark LEEP Journeys? 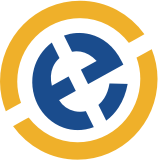 Reach out to us and we’d love to get started.